Horseshoe Crystal Window Sticker in silver with glitter makes a great gift or bling your own things with this great cling. 4"x4" diameter Horseshoe Window Sticker! Choose Blue or Silver. Bling for your car, show your pride. 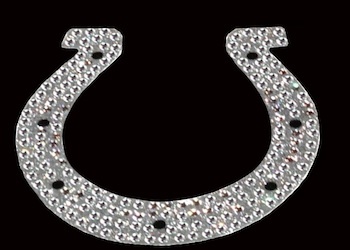 Please click here to check out our Horseshoe Pendant Charm.